Our 2019 Indy 500 Couryard race packages, travel packages and tours for Indianapolis Motor Speedway include great race tickets for the coveted Indy 500, hotel accommodations at the Couryard by Marriott conveniently located at the Indianapolis Airport, roundtrip deluxe bus transfers to Indianapolis Motor Speedway on Sunday for the Indy 500, informative tour booklet,TABA Tour Representative to assist at the hotel and buses, Ticket holder/lanyard, all taxes and more options (see below) to enhance your Indianapolis Motor Speedway Indy 500 race weekend. Be a part of history at the 103rd running of America's most storied race, the Indy 500. Our INDY 500 tickets are located in the Southwest Vista in Turn One of Indianapolis Motor Speedway and also in the Northwest Vista in Turn Four. We also have the J Stand between turn 4 and Pit Road entrance. 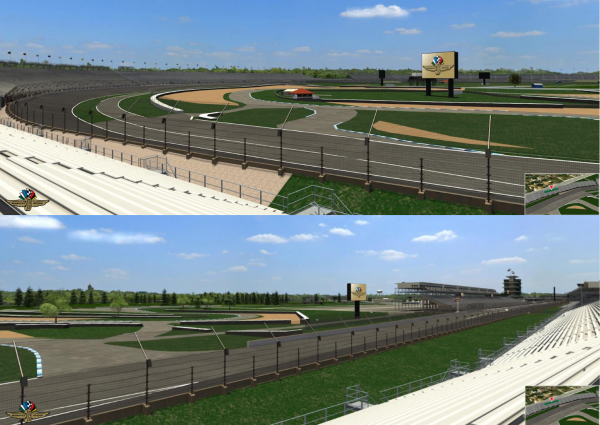 The Northwest Vista has good views coming into Turn 3, and thru Turn 4 toward the start/finish line and of all cars entering the pits. The Southwest Vista is located in Turn One and is the closest grandstand to the bus parking. The Southwest Vista has good views from Turn One through Turn Two. J Stand is located just out of turn 4 on the front stretch close to pit road entrance. A Limited number of upgraded tickets will be available. Upgraded tickets will be in the Paddock Penthouse, Grandstand E or Grandstand E Penthouse. The new state-of-the-art lobby at Indianapolis Airport (IND) hotel provides greater flexibility and choices for guests. The exciting new features at Courtyard Indianapolis Airport hotel include inviting, flexible spaces to work or relax in, free Wi-Fi throughout and easy access to the latest news, weather and airport conditions via our GoBoard. The highlight of the new lobby experience is The Bistro - Eat. Drink. Connect. Guests will enjoy enhanced food and beverage offerings in the morning, all-new dinner service in the evening, or relaxing over cocktails at the end of the day. Patrons looking for an Indy Airport hotel will be only 7 minutes away from their terminal, and 9 miles away from downtown Indianapolis. They offer complimentary airport shuttle service, a fitness center with indoor pool and whirlpool, and convenience to area attractions, including Lucas Oil Stadium. Your stay at Courtyard Indianapolis IND Airport Hotel is sure to be more comfortable, more productive and more enjoyable than ever before. Ticket to the Saturday Legends Day Driver Autograph Session and Indy 500 Drivers Meeting. *Does NOT include Saturday transportation and does NOT include admission into Legends Day Concert (TBA). One of the original events produced by the 500 Festival, the IPL 500 Festival Parade has grown to be one of the signature events held in the United States each year. The Parade is the only 500 Festival event that has taken place every year since the organization’s founding in 1957. The IPL 500 Festival Parade will be held on the eve of the Indianapolis 500. 300,000 spectators are expected to line the streets of Indianapolis, joined by another one million watching from their televisions around the country, to view one of the nation’s premier parades, alongside the Pasadena Tournament of Roses and the Macy’s Thanksgiving Day Parade. The IPL 500 Festival Parade allows all spectators to witness the pageantry and larger-than-life floats light up the streets of downtown Indianapolis. Well-known celebrities, costumed characters, marching bands, patriotic units, specialty units, spectacular floats and giant helium balloons will fill the streets to celebrate the world’s largest single-day sporting event, the Indianapolis 500.